Celery root is unfortunately often overlooked at the supermarket in favor of other, more attractive, brightly colored vegetables. But don’t judge a book by its cover, as it’s easier to prepare than you would think. Place it on its side and slice off the peel and the roots. There are then three options when it comes to how you can cut it. 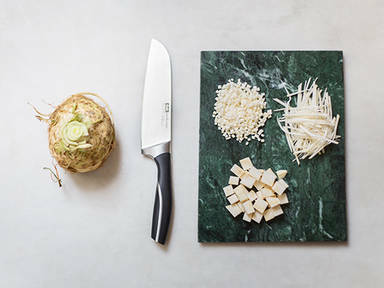 You can either cut the celery root into small cubes, julienne, or finely dice. Celery root can be prepared in a variety of ways, such as fried with some bacon in a breakfast hash, puréed into a thick, warming soup, or even roasted as a steak—a great option for a vegetarian main course. Enjoy with a selection of other vegetables for a nutrient filled and delicious meal.